“Kitchens That Don’t Make Me Yawn” and “Crafts I Don’t Have Time For”—these are the names of two of Jenny Rausch’s Pinterest boards. The kitchen and bath designer confesses that the kitchens that make her yawn are the white ones, and she presumably doesn’t have time for crafts because she and her husband Todd co-own Karr Bick Kitchen + Bath in St. Louis, Missouri. Oh, plus they have three children. And then there’s her presence on several regional television shows and within the many top-tier magazines that feature her work. Karr Bick Kitchen + Bath has been around since 1958, but when Rausch took it over, it was to fulfill a lifelong dream of owning her own business. It’s a venture that has flourished under the Rausch’s care, and today it is one of the most reputable kitchen and bath design and installation companies in the St. Louis area. One look at the Karr Bick portfolio will tell you why; Rausch’s spaces have in common an energy, an elegance and a certain irreverence for design “rules” that make them favorites on Pinterest, in print, on design blogs, and with the whole Native Trails team. NT: What factors led you to select copper for a project, and more specifically, led you to select Native Trails copper sinks? JR: Native Trails will pretty much do anything we want when it comes to making copper. They don’t put me in a box. I also love the finish and how it wears; it moves and changes with time. It’s real, and real things change and evolve. I have it in my house, and I love it. JR: Mostly, I feel like I am a translator and guide, my job is to help you make good choices that live well together and keep you from making mistakes. The space is about you, not me. Your house, your family, and your life. In the end, it’s your dream that has to be realized. I am just along for the journey. I say I don’t have a signature style, but my clients always seem to recognize our stuff. For me, it can be all different things as long as it’s comfortable and livable. You can tell someone lives there; families gather and friends have parties in our spaces. NT: You have used our sustainably-made sinks; do you frequently use eco-friendly materials in your designs? JR: I love using old or reclaimed materials. I would like to tell you it’s about my stewardship of the land but it’s really about texture and a connection to the past you feel when you use old beams or wood siding from a 100-year-old barn on the back of an island. I am a design dork! NT: Do you have any key advice for clients? JR: I will give some very real advice to anyone remodeling when I say: Trust the team you hire. Also, expect problems. There is never an absence of them. My job title really should be “problem solver.” Last but certainly not least, someone will cry. It might be you; it could be me; it might even be the plumber, but I am telling you during a remodel at some point someone is going to lose it. If you know it going in, when it happens you can almost laugh about it. NT: OK, we’re going to try a rapid-fire round of questions here. First off, what is your favorite color for the kitchen? JR: Can I say anything but white? Only because, as a designer, I do get tired of doing the same thing over and over. Can we do some off-white, creams or grays? Please, more of that. JR: I love weathered woods mixed with marble. 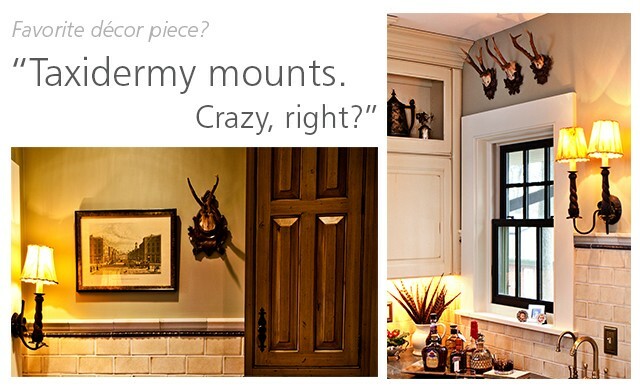 JR: Taxidermy mounts. Crazy, right? JR: A rug that looks like it belongs in the living room. NT: Favorite overall design element? JR: Dishes—they are my toys. I love to set tables and have dinner parties. NT: And finally, tell us about a favorite project you’ve worked on. JR: There are many, but I did get to work on the cottage of a childhood friend where we grew up together. I had a connection to the house and the homeowner; I could boss him around, and he could tell me he hated things and then we could have cocktails on the porch after. We went through the woods, and he dragged home an old pedestal sink that was half-buried in the ground. We used part of the rotten porch wood to build furniture and part of an old barn for wine units flanking the entry to his kitchen. It was just all very different in just about every way and that is always fun for me.